Notes from Jean: If I made the jumper again I would not use such a dark colour for the background because it is inclined to show through the white. I embroidered the picture on in knitting stitch after knitting the jumper, of course it could have been knitted in. For the eyebrows and moustache I made a large french knot over each stitch. No, sorry. I only have the chart. 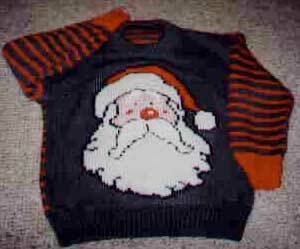 You can use any commercial sweater pattern that has enough stitches and work Santa on the front.